Geek Deal of the Day!! The Rules of the Game Criterion Collection DVD Sale!!! We will soon be announcing revised Blu-ray and DVD editions of Jean Renoir’s masterpiece The Rules of the Game as part of our November lineup—we are replacing one supplement and creating new packaging. Our original DVD edition will then be officially out of print. However, at this time we are offering it at a 65% discount from the suggested retail price at Criterion.com. (Use the promotion code REGLE at checkout.) This makes the movie $13.98. We have a limited supply. We will fulfill orders as soon as we can. 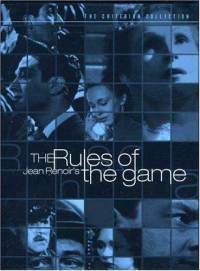 SYNOPSIS: Widely regarded as one of the greatest films ever made, Jean Renoir’s masterpiece The Rules of the Game (La Règle du jeu) is a scathing critique of corrupt French society cloaked in a comedy of manners. Although the original negative was destroyed during World War II, this edition features the fully reconstructed version embraced by audiences and critics around the world as a timeless representation of Renoir’s genius. Geek Deal of the Day! ‘Dark Knight Rises’, ‘Thor’, ‘Star Trek’, and More!!! Geek Deal of the Day! Tons of Criterion Blu-rays on Sale for more than 55% Off!!! Geek Deal of The Day!!! 50% Off Criterion Collection Sale!!! Criterion is Releasing the Ultimate Ingmar Bergman Blu-ray Box Set! This entry was posted on Thursday, August 11th, 2011 at 4:15 pm	and is filed under Film, News. You can follow any responses to this entry through the RSS 2.0 feed. You can skip to the end and leave a response. Pinging is currently not allowed. « HBO RENEWS HIT SERIES TRUE BLOOD FOR FIFTH SEASON!!! [approachs king] Good day for the crows. Remove your army from my land. Why, I like your land, I think we'll stay. I like your soldiers too. They won't fight for you. That's what the Messenians said, and the Acardians, and the Opeians, now they all fight for me. You can't have the whole world Agamemnon, it's too big, even for you. I don't want to watch another massacre. Let's settle this war in the old manner. Your best fighter against my best. And if my man wins? We'll leave Thessaly for good. Boagrius has this effect on many heroes. Be careful who you insult old king. My king, Achilles is not with the army. I sent a boy to look for him.